1. When behavior is unsafe, hurtful or disrespectful to self, others or the environment – it has to be stopped. (We only focus on unsafe and hurtful for toddlers.) If your child hits, kicks or bites you, physically stop him. This may require firmly holding a hand or foot. If that is not adequate, sit down, hold your child on your lap with both of you facing the same direction, your arms and legs wrapped around him to stop the thrashing. Say to him. “I’m going to hold you until you are calm, your voice is quiet, your body is still and I can count to two.” Of course this is when he screams, “Let me go!” Repeat yourself, “As soon as you are calm, your voice is quiet, your body is still and I can count to two I will let you go.” This lets him know exactly when you will let go. The moment your child is still begin counting, “One.” If she starts thrashing or shouting repeat once more. Do not add more time counting. As soon as his body is quiet let go. When you have caught your child early and he is not quite so upset, you may realize that holding him is actually calming him. Listen to his breathing and for him you might say, “I’ll let you go when your body is still, your voice quiet and I can count to twenty-five or one hundred. 2. Vow not to get hijacked by the nasty language. Stay focused on the issue in front of you. If your child is yelling at you or saying mean words, the most helpful response is a tough one to implement when you are hurting and angry. This is where you have to be the adult. Take a deep breath. Remind yourself your child is upset and does not have another way to communicate it right now. This is not the teachable moment – that will come. Now you are trying to understand what he was feeling or needing. You will deal with the inappropriate language later. If the blow-up has been between siblings or peers, state, “I saw you hit, what do you want to tell him?” Or, “I saw you throw the book at him – or grab the toy. I think you had something important to say. What are you trying to say? 3. Stop talking and start listening. Continuing to talk, explain, reason or chastise at this point will only send your child further into the red zone. If your child is too upset to work with you, even though you are trying to understand, take him to a place where he can calm. If he is too big for you to move him, invite him to do something you know soothes him. This is NOT rewarding the behavior it’s simply calming him enough so that he can hear you. 4. Teach your child what to do or say. Once your child is calm, address the behaviors – not the words – we will deal with words in step five. If the issue was between peers say to your child, “Let’s go tell Abe you wanted a turn.” Help your child return to the situation and say to the other child, “I’d like a turn. When will you be finished?” Or, I’m not ready to share right now. I’ll be finished in 15 minutes.” Or, “I want to play alone.” Or, “Mom, help!” Bottom line is teach your child the words to express those strong feelings. 5. Address the poor choice of words by teaching your child respectful words to use instead. During a calm conversation your child can hear you and remember what you told him. The next time he is upset those words will come back to him to use instead of striking out. After a strike out tantrum it is important to reflect on what happened. What preventive measures could you take in the future? Be honest with yourself. How much sleep is your child getting? If your child has stopped napping, a preschooler is getting less than 12 hours of sleep, or a toddler less than 13-14 it’s highly likely that he is short on sleep. If he’s dropped his nap reinstate it. If he’s not a napper then move bedtime earlier. Adequate sleep is the BEST preventive measure for strike out tantrums. Finally, what role did your actions have in fueling this behavior? 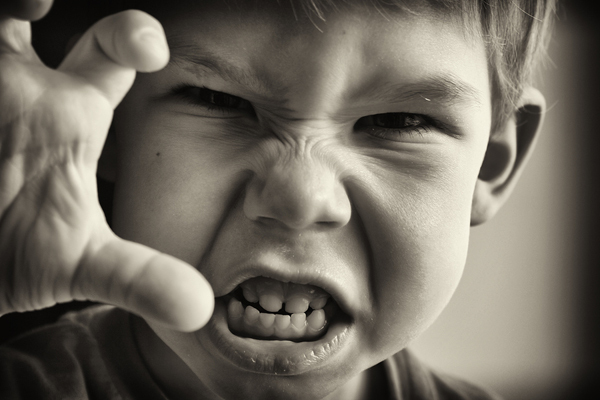 Often strike out tantrums occur because we have been rushing, not listening or intrusive. Promise yourself to slow down. Doing so will stop the hitting, biting, kicking and name calling before they start.